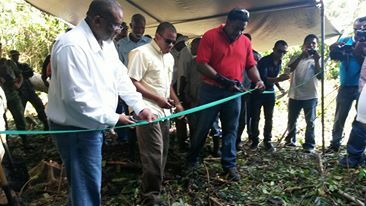 On Wednesday, December 19th the controversial ground breaking of the joint Belize Defense Force (BDF) and Belize Coast Guard (BCG) Forward Operating Base (FOB) was held at an area of land on the northern bank of the of the Sarstoon River in southern Belize. The area where the FOB is to be built had long been claimed by Guatemala as part of their territory, with the country even displaying military hostility towards Belizean armed forces that visit the area. With the ground breaking ceremony over, construction has commenced and the building is to be ready for use within three months. The FOB will bring much needed law enforcement presence to an area that is known for illegal activities. A diplomatic corps, consisting of the Minister of National Security, Honorable John Saldivar, Minister of State for the Office of the Prime Minister, Honorable Frank Mena, Minister of Education, Honorable Patrick Faber, Chief Executive Officer (CEO) of the Ministry of National Security, George Lovell, CEO of the Ministry of National Security Lawrence Sylvester, and two observers of the Organization of American States, traveled to the location along with several members of Belize’s armed forces and the media for the short ceremony. Also partaking in the ground breaking ceremony were Commandant of the BCG, Admiral John Borland and Commander of the BDF Brigadier General David Jones. Upon arriving at the FOB location, protocol was established before selected speakers addressed those in attendance. Honorable John Saldivar remarked on the importance of the event as the FOB had been in the works for quite some time. “This facility that will be constructed at this site will offer our law enforcement authorities increased capacity in surveillance, tracking and intercept capability. It will contribute tremendously to the efforts of national and regional security in controlling the threats from transnational crime, drug trafficking, human and weapons trafficking and other criminal activities,” said Saldivar who went on to point out the importance of the base not only to Belize but the region. “We in the Ministry of National Security recognize that for us to achieve this vision, we must address the threat to our national security and regional security from an integrated approach, where neighbors share responsibility and participate in this effort. We must work in partnership with the international community, if we are to defeat the various threats that confront us. The construction of this FOB will assist in working with our neighbor, Guatemala, in strengthening the law enforcement security arrangements in a cooperative manner for our mutual benefit. 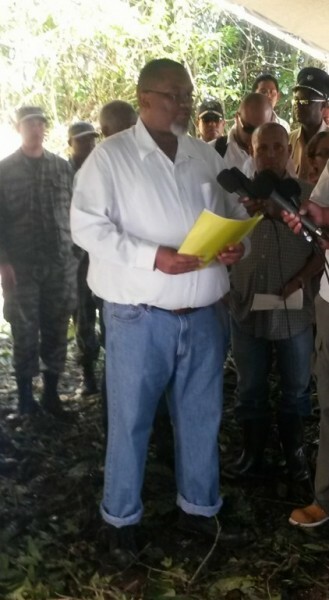 It is my hope, that in a very short time, from this day, we will be looking at working jointly and in harmony with each other and in a manner that will ensure that the peace and understanding along the Sarstoon will be of mutual benefit to both our countries and the region,” said Saldivar. 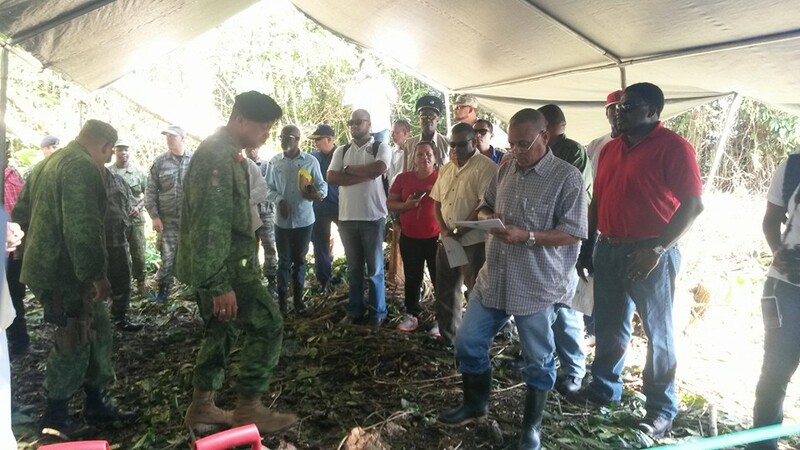 The FOB will serve to address the transit of illegal human, drug and weapon trafficking as well as illegal logging and fishing at the Guatemala-Belize maritime border. The FOB is expected to cost around $100,000 with the location having been selected after careful consideration as to geographic composition of the nearby area. “The area where the FOB will be built was determined by the military experts. The location that was chosen is the ideal place to get the best vantage point because it is not necessarily just to watch the river but to watch the coast as well. The land is also more stable so it can withstand the weight of the building without having to worry about construction mishaps,” explained Saldivar. And while the Guatemalan government has stopped opposing the construction, they did sent a diplomatic note asking GOB to not interfere with fishing practices carried out by Guatemalan’s in the area. Saldivar has indicated that they have reassured Guatemalan authorities that the FOB will not interfere with the two countries relationship and fishermen will not be bothered as long as they are not conducting illegal activities. “I want to give assurance to our neighbor, Guatemala and all other friendly nations that our law enforcement authorities will conduct their operations along the Sarstoon in a manner that is conducive to cooperation and good neighborliness. It is not the government’s wish to encourage or condone behavior that will disturb the peace and security between Belize and Guatemala,” said Saldivar. He also indicated that an invitation was extended to the Foreign Minister of Guatemala even though they were not present at the ceremonies.